Money problems in the NHS in England are becoming "endemic" - and despite the extra money promised by government, there is no guarantee the service will get back on track, auditors say. The National Audit Office (NAO) said levels of deficits were "becoming normal practice". Last month, ministers unveiled plans to increase the NHS budget by £8.4bn above inflation in this Parliament. But the NAO said it was not clear if that would lead to stability. It said much would depend on how NHS England's five-year plan for reforming services panned out. Set out last autumn in a document called the Five-Year Forward View, this involves providing more care out of hospitals in a bid to save £22bn by 2020. But the NAO said it relied on "untested" plans for which there was "limited evidence". The auditors highlighted the growing levels of deficits in the health service. This year, a deficit of more than £2bn is being forecast by NHS trusts - the bodies responsible for hospitals, ambulance services and mental health units. Overall, three-quarters of the 239 trusts were overspent at the half-year mark, with the most serious problems being seen in hospitals. The problems compare with an overspend of just over £840m last year - with the NHS overall relying on bailouts from the government and raiding the capital budget, which is meant to be used on buildings, to balance the books. The year before that, there was a small overspend and that came after several years of surpluses. Make no mistake, the warning by the National Audit Office is severe. This is a body that uses language carefully, so for it to talk about deficits becoming "endemic" and the current situation being "unsustainable" is pretty unusual. The fact is that the NHS is entering almost unchartered territory. The last time it racked up significant deficits was a decade ago. But they weren't on this scale. And, then, the health service was able to spend its way out of the problem (the budget was increasingly rapidly year-on-year by about 7% above inflation). That option is not available this time. The extra money this Parliament works out at less than 2% a year. You probably have to go back to the early 1950s - just after the health service was formed - for the last time money was so tight. The response then? Services were scaled back and charges introduced for the likes of dental care, spectacles and prescriptions. This time, much hope is being attached to NHS England's five-year Forward View. It talks about moving care away from hospitals and a greater emphasis on prevention. If that doesn't work, everyone agrees, the health service has a huge problem. The NAO said problems being seen now were unsustainable - and could end up consuming much of the budget increase the NHS is getting. NAO head Amyas Morse urged the government and regulators to get a grip. "Running a deficit seems to be becoming normal practice for acute trusts," he said. Meg Hillier, chair of the House of Commons' Public Accounts Committee, said: "It is simply unacceptable. The strain placed on NHS trusts shows no sign of abating." Meanwhile, Anita Charlesworth, of the Health Foundation, a leading NHS think tank, described the finances as "truly dire" and called for a transformation fund to be established to ensure changes in the five-year plan took place. 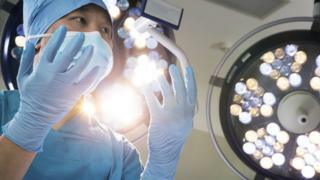 But Health Minister David Prior said the extra money for the NHS in the coming years showed the government was "committed" to the health service and predicted finances would be much stronger next year. "Hospitals must now show tight financial grip and fully introduce our measures to reduce expensive temporary staffing and drive through the productivity and efficiency improvements," he added.